To begin with, I made some more hats for the Little Hats, Big Hearts program that I wrote about last week. I returned to the Creative Preemie Hat pattern by Laura Reavis, but with Lion Brand Heartland Thick & Quick in colorway 113 Redwood. It’s a Super Bulky acrylic yarn in a two-tone red. The combination of the preemie pattern with the thicker yarn resulted in hats that are a standard newborn size of about 14 inches (35.5 cm) in circumference. 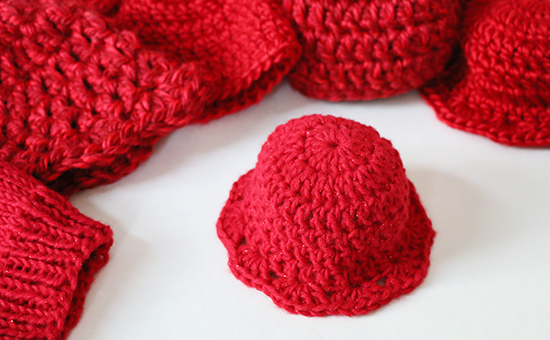 I have ten hats complete now, in a variety of baby sizes and soft, red acrylic yarns. Going back a couple more weeks on the blog, I wrote about rediscovering a drawer full of forgotten kits. Did I mention that a good number of them are Christmas kits? I suppose that’s part of the reason I’ve been holding on to them for so long. For me, the window of interest for working on Christmas projects is small — and extra time is already in short supply during the holiday season. 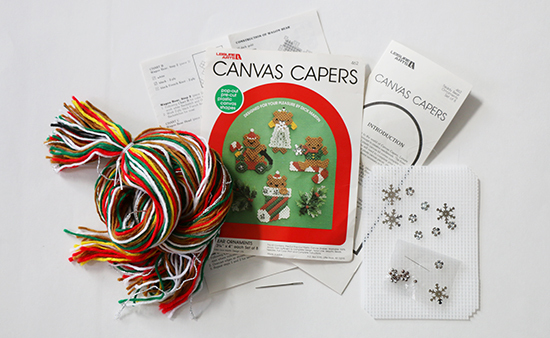 Nevertheless, I worked my way through another Christmas-themed plastic canvas needlework kit from the Canvas Capers line by Leisure Arts. 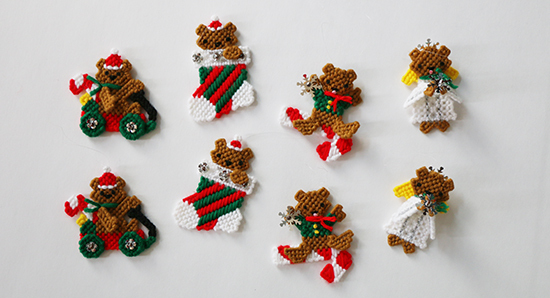 This time it was a set of ornaments, #462 Teddy Bear Ornaments, with a copyright date of 1985. I have to be honest; although the ornaments are adorable, this kit was not fun for me. There were a lot of small pieces, some less than a half inch (1 cm), and one ornament in particular required quite a bit of work with transparent nylon thread. Tiny pieces and invisible stitches do not make me happy; I was actually caught cursing at the little teddy bear angel. The kit was a set of eight, two each of four different designs. Normally, I don’t mind making two of the same thing — mittens, socks, etc. — but it was daunting to revisit each of these fussy little guys. Finishing the kit was an act of pure stubbornness. Proof that I really made all eight ornaments! 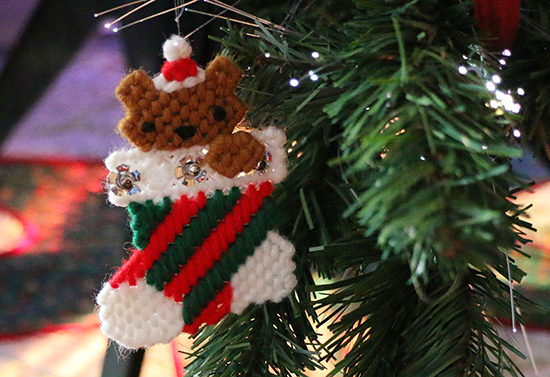 Each ornament measures about three to four inches (7.5 to 10 cm) in each direction. Little pieces were attached to a larger main piece to add depth and to cover the backs of the ornaments for a neater finish. With Christmas less than three weeks away, my window for holiday projects is quickly closing and I don’t expect to make more of the Christmas kits this year. I think the break will do me good — particularly because I have (gasp!) a duplicate of this kit. Good on you for perservering!!! They look great hanging on your tree. Thank you! I'm glad I stuck with them. AAAWWW, they are so cute. So proud of you for completing all 8 knowing how rough it was to do the first 4. I love plastic canvas crafts. I have ornaments somewhere in storage that I made with all of my extended families initials on them. When you finish the other set they will all come together to decorate a beautiful tabletop bear tree. Thank you, Barbara. Your ornaments sound like wonderful heirlooms. I've been collecting teddy bears since I was a child, so most of the full size tree is already covered with bear ornaments — these fit right in! I love the little hats! The red is very pretty and perfect for the season. Your ornaments are sweet. And I agree that a backing would be a smart way to finish the pieces. I'm impressed that they are so small. Thank you, Mary! Yes, the backing makes sense, especially for an ornament that might rotate on the tree.